The Victorian era was the period of Queen Victoria’s reign, from June 20, 1837 until her death on January 22, 1901. It was a long period of peace, prosperity, “refined sensibilities,” and national self-confidence for the United Kingdom. In Violet Harper’s world (and soon Florence Nightingale’s), readers of my books have experienced glimpses into some of these prominent dates. August 14, 1834 –This Day in History: The Poor Law Amendment Act is passed, introducing workhouses for the healthy poor. And thus, Violet Harper finds her adoptive daughter, Susanna, in 1861. September 10, 1846 — This Day in History: Elias Howe of Massachusetts receives a patent for his sewing machine. Funeral fashions can now be made in record time! December 1849 – This Day in History: Florence Nightingale accompanied family friends Charles and Selina Bracebridge on a trip to Egypt and Greece. She sailed down the Nile and documented her trip. Of course, this was 20 years before the Suez Canal even opened, but it’s fun for me to think of both her and Violet Harper spending time in this exotic land. It’s out of print, but you can still find copies of Florence’s book, Letters From Egypt. March 28, 1854 — This Day in History: Britain and France declare war on Russia, and the Crimean War begins. You may recall that in Stolen Remains, Lord Raybourn’s son fights in the Crimean War. Of course, the most famous figure of the time was Florence Nightingale, who did remarkable things to revolutionize the nursing profession, once considered so lowly that it was barely a step up from prostitution and acting. January 29, 1856 — This Day in History: The Victoria Cross. Queen Victoria introduced this award to honor acts of great bravery during the Crimean War, the conflict where Florence Nightingale gained fame for her tireless work. The queen personally awarded the first Victoria Crosses to 62 men at a ceremony at Hyde Park. August 16, 1858 — This Day in History: The first transatlantic telegraph is inaugurated by Queen Victoria and President James Buchanan, with the words “Europe and America are united by telegraphy. Glory to God in the highest; on earth, peace and good will toward men,” sent from England, at the lightning-fast speed of one word every ten minutes. Less than a month later, the cable had failed, leading some people to claim that the whole thing had been a hoax and there had never actually been a working cable. October 1, 1861 — This Day in History: The complete version of Mrs. Beeton’s Book of Household Management, consisting of 24 collected monthly installments, is published; and becomes one of the major publishing events of the 19th century. Violet Harper is not happy. 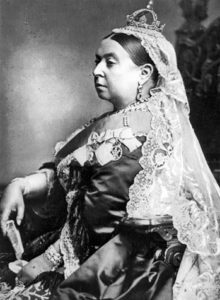 January 1, 1877 — This Day in History: Queen Victoria is Declared Empress of India. India came under direct British government control in 1858, when the remaining authority of the East India Company was dissolved. Prime Minister Benjamin Disraeli suggested to the queen that she should be proclaimed empress. The queen was quite keen on the idea, which Disraeli’s predecessor, Gladstone, had been reticent to pursue. Legislation, known as the Royal Titles Act, was pushed through parliament on May 1, 1876, although Victoria would not officially use the title until January 1, 1877. June 26, 1879 — This Day in History: Isma’il Pasha, Governor of Egypt, is Deposed. Isma’il Pasha was the khedive—or governor—of Egypt. He was deposed on orders of the Sultan of the Ottoman Empire, who ruled Egypt at the time. The sultan also commanded that Isma’il’s son, Tewfik, be proclaimed khedive. This photo shows Isma’il and his son when Tewfik was still a young child. He took his father’s position when he was 28 years old. You will meet Isma’il Pasha in A Grave Celebration. June 15, 1888 — This Day in History: Frederick III of Prussia Dies. Frederick was married to Vicky, Queen Victoria’s daughter. It was an arranged marriage, but by all accounts, a happy one; producing 8 children. You will meet Frederick in Lady of Ashes mystery book 6 – A Grave Celebration. September 4, 1888 — This Day in History: George Eastman patents his roll-film camera and registers the Kodak trademark. Violet Harper’s post-mortem daguerreotypes will soon be a thing of the past! January 22, 1901 — This Day in History: Queen Victoria’s reign ends. After being diagnosed with “cerebral exhaustion,” the queen died at Osborne House on the Isle of Wight, aged 81. After a magnificent funeral procession through the streets of London on February 2, Victoria was laid to rest next to Albert in the royal mausoleum at Frogmore House in Windsor. The Victorian age was at an end.